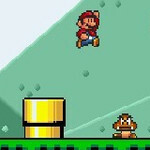 Playing Super Flash Mario Bros. Description: A nice remake of the classic Super Mario Bros, with all the graphics, music and sound ported over from the original Nintendo games. You can play as either Marioor Luigi and take on the evil Koopa and his army, collecting coins as you go. Finish the level by making it past his henchmen and reach to the flag.